Newcastle 3 – 1 Blackburn – Move. Run. Sports. A very impressive performance from the lads all over the pitch as we really did out class Blackburn all over the pitch. But most importantly in midfield . . . Yohan Cabaye and Cheik Tiote have formed a very impressive central midfield partnership. With the latter eventually looking like his brilliant self from last season – after struggling to begin with this term. We are still undefeated and looked very good against a struggling Blackburn side (that result against Arsenal last week was a fluke). But I was more surprised than anything to see such a good performance. It just shows that you have no idea what to expect from game to game. 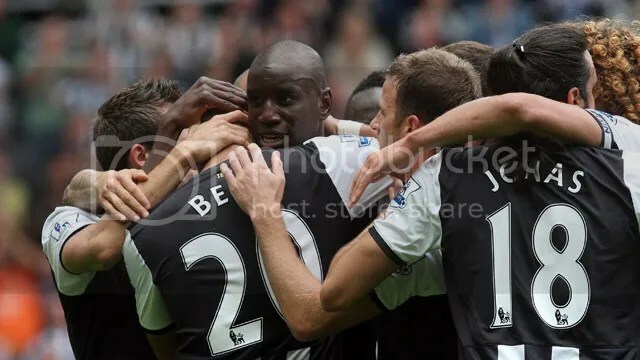 Especially the hat-trick from Demba Ba – who did not have the best of starts and actually looked terrible in his first few games. But on Saturday looked a totally different player. More of the same from him will be much appreciated! The team spirit among the team looks an all time high and we have benefited from getting rid of the so-called dressing room leaders Nolan and Barton and getting rid of Enrique too. Since those three players have left (and voiced their concerns about the club) we have gone from strength to strength – mainly just proving that inside of helping the club and team they were in fact just holding us back! Yes that may sound very bold but our start to the season has been so unexpected.